Thursday's decision by Oregon's Court of Appeals affirmed BOLI's conclusion that the bakery's owners violated the civil rights of a lesbian couple and a state law that businesses not discriminate based on sexual orientation. Oregon's Court of Appeals has upheld a decision to require the owners of a now-closed Gresham bakery to pay a lesbian couple $135,000 in damages for refusing to make them a wedding cake. 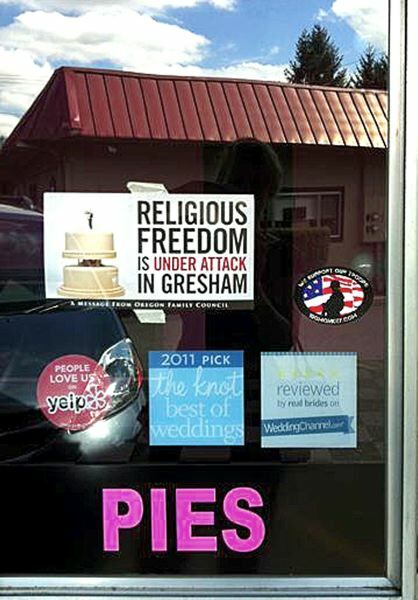 Sweet Cakes owners Aaron and Melissa Klein's refusal to bake the cake for Rachel and Laurel Bowman-Cryer in January 2013 made national headlines and prompted Bureau of Labor and Industries Commissioner Brad Avakian to award the damages to the Bowman-Cryers for emotional distress. On Thursday, Dec. 28, the court affirmed BOLI's conclusion that the Kleins violated the civil rights of the couple and Oregon's law that businesses not discriminate based on sexual orientation, as well as the associated damages. "For the past 10 years, the Oregon Equality Act of 2007 has protected Oregonians from unlawful discrimination in housing, employment and public places," Avakian said in a statement. "Today's ruling sends a strong signal that Oregon remains open to all. "Within Oregon's public accommodations law is the basic principle of human decency that every person, regardless of their sexual orientation or gender identity, has the freedom to fully participate in society." The court found that "the record of the complainants' emotional distress from the denial of service was adequate to support the damages award and that the award was not inconsistent with awards in other BOLI enforcement actions." The court overturned Avakian's conclusion that there was sufficient evidence to show the Kleins planned to continue the discrimination, but the commissioner had awarded no damages for that specific violation. The Kleins had appealed the BOLI commissioner's decision, arguing that it violated their constitutional right to free expression. Their attorneys said that they are considering options for a next step, which could include appealing the decision to the Oregon Supreme Court. Sweet Cakes closed in September 2016, according to Facebook post by Melissa Klein. The First Liberty Institute, which backed the appeal, expressed disappointment with the ruling. "Freedom of expression for ourselves should require freedom of expression for others. Today, the Oregon Court of Appeals decided that Aaron and Melissa Klein are not entitled to the Constitution's promises of religious liberty and free speech," said Kelly Shackelford, First Liberty Institute president and chief executive officer. "In a diverse and pluralistic society, people of good will should be able to peacefully coexist with different beliefs." The unanimous decision of the Court of Appeals was written by Judge Chris Garrett and joined by Judges Joel DeVore and Bronson James. ?